Created from the early-modern period and into the present, shiviti manuscripts are found in Hebrew prayer books, ritual textiles, and on the walls of synagogues and homes throughout the Jewish diaspora. Wrestling with ways to externalize the presence of God in Jewish life, these documents center upon the graphic representation of God's ineffable four-letter Hebrew name, the Tetragrammaton, and associate it with words and imageries that evoke mystical powers, protective energy, and angels, as well as key places and characters in Biblical and Jewish history. Deciphering the content of a shiviti manuscript, or simply classifying it within the realm of Jewish cultural production, is a fascinating puzzle for today's scholars. Research on these documents encompasses the analysis of biblical and prayer texts, magical formulas, visual motifs, and various modalities of material culture across the Jewish world. The very presence, and use, of the shiviti in such varied contexts as individual and communal prayer, the celebration of life cycle events, and the production of (and demand for) amulets for personal and household protection, opens new paths in the understanding of the role of text in Jewish culture. The persistence of these documents in Jewish life attests to the ongoing beliefs in the power and efficacy of magic and meditation that accompany the more normative aspects of Judaism as we know it. The exhibition highlights a selection of shiviti manuscripts, books, amulets and textiles from The Magnes Collection of Jewish Art and Life. 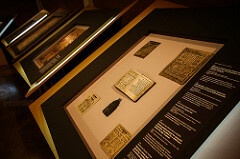 The display is accompanied by new media art created especially for this project by Greg Niemeyer, as well as by resources and quotations that allow viewers to penetrate the elaborate textual and visual elements, while also experiencing the inherent power of the unique cultural objects on view.